PT Bhanda Ghara Reksa (Persero) - BGR or most commonly known as "BGR Indonesia" is a well-established state-owned company in Indonesia, running business in the field of logistic and warehousing services. BGR Indonesia engaged in logistic services, transportation, warehousing, courier services and freight forwarding. PT Bhanda Ghara Reksa (Persero) is a non listed state-owned company and is fully-owned by the Government of Indonesia which represented by the Minister of State-Owned Enterprises (SOE). 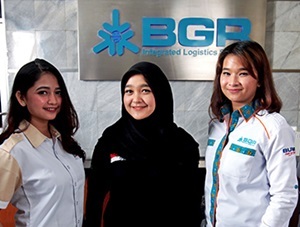 Based in Jakarta BGR Indonesia runs its business through 24 branch offices and directly employs nearly 1,424 staff spread across Indonesia (as of December 2016). BGR Indonesia also supported by 623 warehouse units with installed total warehouse capacity of 1.56 million tons. In term of financial performance, BGR Indonesia posted an increase of 10.31% in total revenues. BGR Indonesia booked total revenue of Rp 1,012.78 billion in 2016 as compared with Rp 918.04 billion in 2015, according to information found in PT Bhanda Ghara Reksa (Persero) Annual Report 2016 as cited by JobsCDC.com. Total assets in 2016 was recorded at Rp 948.07 billion, an increase by 23.644% as compared with Rp 766.77 billion in 2015. BGR Indonesia’s total comprehensive income in 2016 amounted to Rp 49.50 billion decreased by 17.56% compared to the year 2015 amounted to Rp 170.80 billion. Maximum age of 30 years old. Education minimum Bachelor of Law (S1) with accredited "A" study program from a Leading University..
Preferably have a minimum of 2 years experience in the same position. Fresh graduate are welcome to apply. Fluent in English with a minimum TOEFL score of 425 or a minimum of Conversation Level Beginner. Minimum height of 160 cm for Male and a minimum of 155 cm for Female with ideal body weight. Preferably have a special education certificate for the advocate profession. JobsCDC.com now available on android device. Download now on Google Play here. Please be aware of recruitment fraud. The entire stage of this selection process is free of charge. PT Bhanda Ghara Reksa (Persero) - Fresh Graduate Officer BGR February 2019 will never ask for fees or upfront payments for any purposes during the recruitment process such as transportation and accommodation.